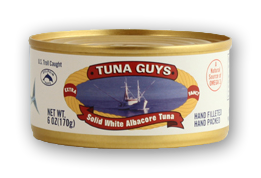 Our hand-packed solid white albacore tuna are from the cold waters of the Pacific Northwest. Low in mercury compared to larger albacore caught in off-shore Pacific waters, and much higher in heart-healthy omega-3 oils. Light, tender and delicious with a flavor that's hard to beat. Get Free Standard Shipping to anywhere in the United States. INGREDIENTS: Albacore Tuna and Salt.